On the drive in to London, as we neared West Drayton or Colnbrook, Parky flicked through a few of the CDs that he had brought along for the day. Once a Squeeze greatest hits selection was chosen, I knew that their songs would provide the backdrop for the day, which would primarily be spent in the band’s back garden of South London. Before we knew it, there was talk of The Sweeney doing ninety ‘cus they’ve got the word to go to catch a gang of villains in a shed up at Heathrow. It all seemed very apt. Soon there would be talk of Wandsworth and Clapham. London – or at least the Southern part of it – stretched out before me as I climbed up on to the Hammersmith flyover. After a two week hiatus, it was good to be back in town. And my thoughts of the day would eventually be recorded here on paper; my chills and thrills and spills. After a swift pint in the “Prince of Wales”, we caught the over ground train at West Brompton, which then took us tantalisingly close to Stamford Bridge, before stopping at Imperial Wharf. One of the alternatives to our new stadium plans of 2011, the area is now overflowing with new apartment blocks. We crossed the River Thames at Chelsea Harbour. The trip to Selhurst Park last spring was still fresh in my mind; it made me wince. It was, in my mind anyway, our worst performance of 2013-2014, as limp and disjointed a showing as I can remember. With rumours of Diego Costa being absent for the afternoon’s rematch, I briefly wondered if our attack would be equally ineffective this time. That night I ain’t forgotten. With some or other passions. We alighted at Thornton Heath in order to prise Andy and Darren out of “The Railway Telegraph”, before heading up to Norwood Junction to meet other friends. The pub was full of Chelsea, with a healthy cluster of OB settled outside, keeping their beady eyes on proceedings. Andy, the leader of the OC Hooligans (yep, them once more) was in town for one game and one game only. It was a pleasure to see him once more. Once away from the pub, I asked a policeman for directions to Thornton Heath. We envisaged a fifteen minute walk. Although the room was smelly. And all our time it took up. The four of us began our walk to Norwood Junction. The weather was overcast but horribly muggy. We soon started to boil. As we walked on and on, we canvassed opinions from a local. It became obvious that the policeman should not have been trusted. We headed back on ourselves, amid consternation from Andy – from Los Angeles – who just wasn’t used to the English habit of walking. So I had a bath on Sunday. And nothing now could stop her. Lo and behold, we found ourselves at Selhurst station, and we sighed. Our detour had wasted twenty minutes of our valuable pre-match drink up. Darren tried to soothe our minds by saying that it was better to have a crap pre-match and a great game than vice-versa. With thoughts of the game in March, I agreed. Still, Norwood Junction was out of view. We trundled on. Each week to make her better. With little kicks inside her. While I was on holiday in Albufeira last May, I bumped into some Crystal Palace youth players and I promised myself to buy the match programme – for once – to see if I could spot any names and faces. One of the lads was a Chelsea supporter, from Sutton, and I wondered if he was experiencing mixed emotions on this particular match day. I wondered where his loyalties were lying. I presumed that as he was on the books of Crystal Palace, there would be a tremendous upsurge in confidence around the whole club, at every level, should they defeat the league leaders. But I tried not to think about that. Within a year a walker. If there could be another. No more nights nappies smelling. At last, the bus stopped and we bundled off. As we approached the boozer, we noted a few friendly faces heading towards Selhurst Park. At least there would be more room in the pub for us. At last we stepped inside “The William Stanley.” We were almost an hour late, but we had arrived. We could relax. I’m really up the junction. The four of us guzzled pints of Kronenburg, and then met up with Alan, Gary, Daryl and Cath. The pub was emptying. Within ten minutes, we were on the short walk to Selhurst Park. Once inside the stadium, it was obvious that most of the away supporters had spent more than our ten minutes inside various boozers. The mood was raucous. The hoolifans (copyright Martin King) were out in force. Amid the stadia’s old-fashioned features and cramped gangways, the buzz was tangible. Home games at Chelsea might attract a wide range of social strata, but away games remain the predilection of our traditional working class hard-core of old. My seat was at the very rear of the lower section of the Arthur Waite Stand. Back in the ‘eighties, the lower section was standing only. In truth, the lower section would be standing only in 2014 too, albeit with the added intrusion of plastic seats getting in the way. The stand was dark and cavernous; good acoustics, though. Sadly, the rake of the terraces remained shallow and it meant that I spent some of the game on tip-toes as I strained to watch the game unfold. At times, I was unable to see any of the action in the far left corner, down where the Palace Ultras provide a noisy backdrop to the games at Selhurst. There was a near capacity crowd as the teams lined up. Chelsea were in all yellow again. I quickly scanned the team. Diego Costa was indeed out, to be replaced by Loic Remy. The league ever-presents in 2014-2015 now stood at eight; Courtois, Brana, Dave, JT, Gary, Matic, Cesc and Hazard. There was a lively start to the game with Campbell forcing a low block from Courtois within the first two minutes. At the other end, a free-kick was awarded to us and there was a little delay as the referee moved the wall back. This, as always, heightened the sense of drama. Oscar clipped the free-kick up and over the wall and it spun across Speroni’s goal before nestling in the far corner. We were 1-0 up after just six minutes and Alan gave me a massive bear hug. “Come on my little diamonds” I gasped. A blue flare was let off around ten rows in front and the fumes were a vivid reminder that we were back in business. However, Gary Cahill was soon showing the same geographical awareness that we had shown on our lengthy walk from Thornton Hearth to Norwood Junction, allowing Campbell to lob over. With Matic covering a lot of ground, he was making up for his woeful performance last season. 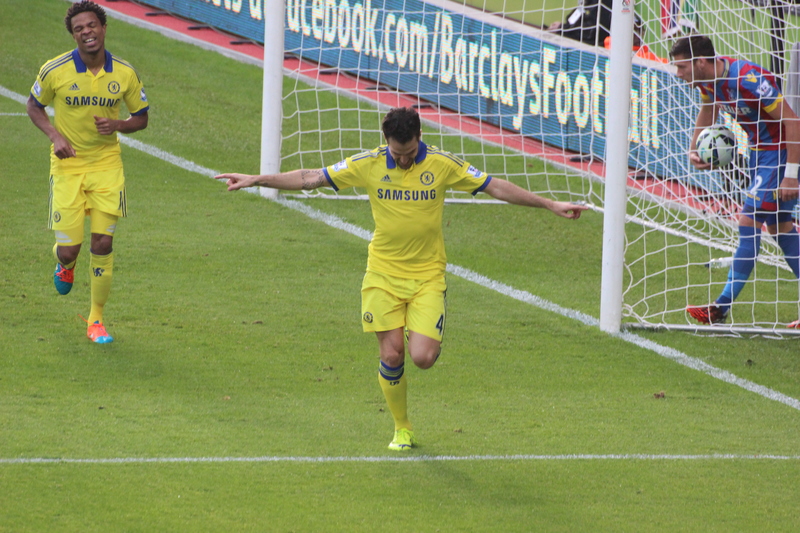 Fabregas was picking passes into supporting team mates. We were playing some lovely stuff. Willian fired over. A fine run from Bolasie reminded us that Palace were an occasional threat. Thankfully his shot was screwed wide. As far as lyrics go, Glenn Tilbrook and Chris Difford needn’t worry. Of course, Crystal Palace used to wear these colours too, way back in the late ‘sixties and early ‘seventies. In fact, few clubs have had as many kit changes as Palace over the years. Our position of comfort seemed in jeopardy when a silly lunge by Azpilicueta scythed down Jedinak right in front of the referee. The Palace fans whooped as he was shown the red card. Mourinho re-jigged, replacing Willian with Filipe Luis. Incredibly, Palace were then reduced to ten men when Delaney was given a second yellow for holding back Remy. The Chelsea support, concerned that our lead would be jeopardised, roared. We had heard that Manchester City had walloped Tottenham 4-1, so we just needed us to hang on to the win. The first-half had been mainly positive, with a few fine periods of play, though there was an annoying doubt in my mind that Palace might threaten in the second period. We looked at ease in the opening minutes of the half, and a fine move through the heart of the Palace defence resulted in a series of one-twos, which finally fed in Fabregas who slotted home. It was a stunning goal. I watched as Fabregas raced towards the baying three thousand supporters in the Arthur Waite. It was party time once more. Hazard went close, but our weighty possession didn’t provide too many other scoring chances. A perfectly-timed tackle by Cahill was one of the highlights of the game. In the stands, with ten minutes left to play, it was time for us to nick the song of the day and to give it new life. This lasted five minutes, then six minutes, then seven minutes, then eight minutes. When Palace cut through our defence to score, we hardly paused. Thankfully, the merest hint of an embarrassing draw was averted and we held on. The singing continued as the players thanked us for our support. Only four walked towards us though; must do better. John Terry, Chelsea captain for the five-hundredth time, walked right up to us, though. It was a lovely moment. We walked back to Norwood Junction and – with great relief – I slumped in a seat on a train headed for London Bridge. Until that point, I had been on my feet for around five hours. Our route back in to the centre of London took us past The Den. At London Bridge station, under the iconic Shard skyscraper, around seventy riot police formed a formidable sight on the station concourse. Had there been an act of terrorism, or was an apocalypse close? No, Millwall had just played at home. I guess such scenes at London Bridge are common on Saturday afternoons. It had been another good day. This entry was posted in Season 2014-2015 and tagged 2014-2015, Atmosphere, Crystal Palace, London, Songs by Chris Axon. Bookmark the permalink. Hi, not sure you will see this. Ended up in London tonight and heading down to find ticket. Enjoy your posts in Dallas. If you head to The Goose, there’s one ticket available. Ask for Parky. Up the Junction!!! Love, love this song from my youth. Played the CD for my 17 yr old driving to Utah, cool for cats as well. Nice blog Chris.